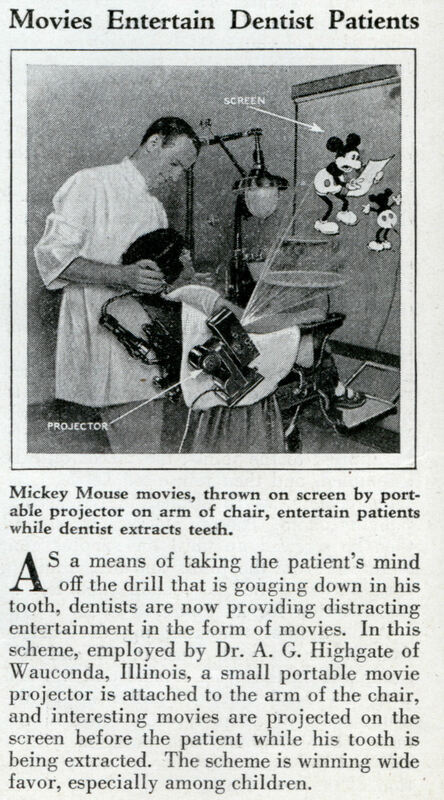 AS a means of taking the patient’s mind off the drill that is gouging down in his tooth, dentists are now providing distracting entertainment in the form of movies. In this scheme, employed by Dr. A. G. Highgate of Wauconda, Illinois, a small portable movie projector is attached to the arm of the chair, and interesting movies are projected on the screen before the patient while his tooth is being extracted. The scheme is winning wide favor, especially among children.